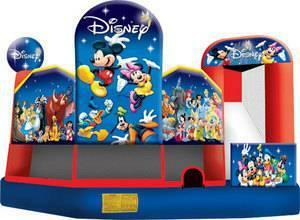 The licensed World of Disney 5-in-1 combo bouncy castle brings the magical Disney experience to any party or event. This bouncy castle offers five panels of brilliant digital artwork, featuring all the beloved characters such as Mickey and pals, the Disney Princesses, Peter Pan, Alice in Wonderland and more, even the seven Dwarfs! Kids can choose from five cool exercises in the 5-in1 combo, playing under the stars from World of Disney.